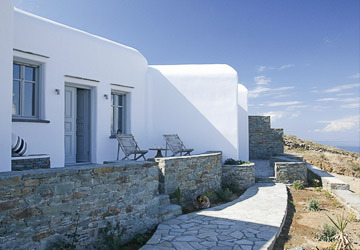 Looking for accommodation in Folegandros island with sea view and all comforts ? Most of the hotels and rented rooms are renovated. This means the average quality is high. Some even have the deprecated swimming pools. They are located in Karavostasi, Chora, Ano Merià and Angali and almost all are at walking distance from the villages’ center. They often have a spectacular view over the Aegean sea and the villages. Not many family apartments to let. 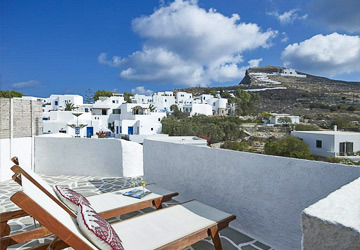 At Folegandros you will find very few family apartments or houses to let. The average and recommended length of stay is from 5 up to 10 days. Rooms are equipped with the necessary to make your own breakfast. To eat out is not particularly expensive. Free camping is not allowed in the island. The Folegandros camping is called Livadi Camping, renewed with good facilities, quiet and nice rest areas. It is equipped with showers, a kitchen, a laundry area, a coffee bar, and a shuttle to and from the port. Friendly and gentle managers. Closest beaches: Livadi and Katergo. Booking for July and August is mandatory and we suggest doing it much in advance. There are always buses meeting the ferries, leading to the Chora, Angali and Ano Merià. Taxi available to other lodging areas. Boasting a privileged location a few metres away from Karavostasis Port, the 5-star Anemi offers minimal, design accommodation with Cycladic features. 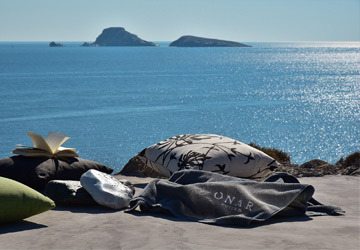 Centrally located in Karavostasi, the Cycladic-style Onar Suites Folegandros offers elegantly decorated suites with unobstructed views over the Aegean Sea. AMO Suites is situated in Karavostasis. Free WiFi is offered . All units feature a flat-screen TV. Some units have a seating area and/or balcony. 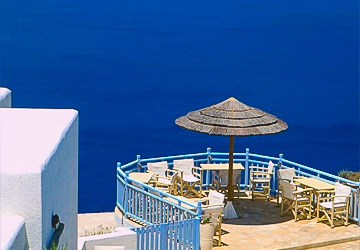 Escape to this idyllic resort on the small island of Folegandros, in the southern part of the Cyclades. The centre of Folegandros is just 200 metres away. Free Wi-Fi access. Enjoying full views of the Aegean Sea, the white-washed Belvedere features self-catered accommodation and free Wi-Fi in public areas. 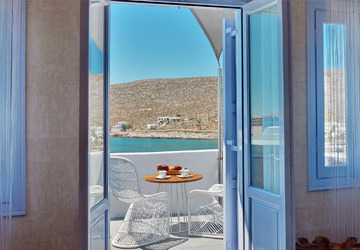 Located in the scenic Folegandros Town, Aria Boutique Hotel features a pool, a hot tub and a sun terrace with panoramic views over the Aegean Sea. Just 150 metres from the centre of Chora, the Cycladic-style Fata Morgana offers a swimming pool with hydromassage facility and poolside snack bar. 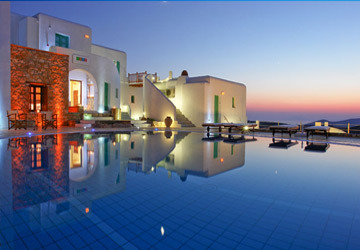 Centrally located in Folegandros Town, the Cycladic-style Polikandia Hotel features a 21 m pool with separate children’s section and hot tub. Within 300 m from the centre of Chora Village, Aspalathras White Hotel rooms feature an island décor and include free Wi-Fi and village views. 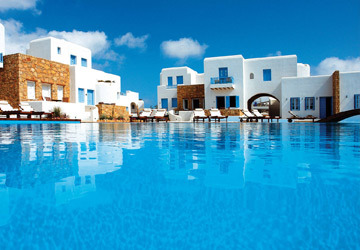 Featuring an outdoor pool with views of the Aegean Sea, Provalma Studios is located in the centre of Ano Meria village. Built according to the local architecture. Offering an outdoor pool and poolside bar-restaurant, Lemon Tree Houses are located in Áno Meriá. Free WiFi is available throughout the property. Built on a rocky hillside, Blue Sand Hotel in Folegandros is just 15 m from Agali Beach and offers units with Aegean Sea view.